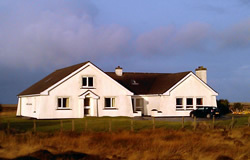 Within walking distance of the village of Daliburgh, Grianaig sleeps 8 making it ideal for a family or group holiday. Refurbished in 2013 the property offers all accommodation on the ground floor, consisting of a large open plan living area and four spacious bedrooms all with en-suite showers. The main living area is open plan combining a large lounge, fully fitted kitchen including dishwasher and dining area, making it a fantastic social space. We have four spacious bedrooms, two large double bedrooms, both en-suite with double sized thermostatic mixer showers. We have a west facing twin room with en-suite shower and our fourth room can be either double or twin dependent on your party's needs, this room has an en-suite with large bath and shower. The property is heated throughout by an oil fired central heating system which is complemented by an open fire and you'll find a well stocked library of local interest books in the spacious lounge area. With a separate utility room housing washing machine, dryer, traditional pulley and extra sink the practicalities are all covered. Wi-Fi is available free of charge as are a cot and high chair on request and dogs are welcome by arrangement. From the moment you arrive at Grianaig House, you are only 15 minutes walk from moorland, machair, sea trout or salmon fishing and within easy walking distance of the village of Daliburgh and Askernish Golf Course.